If you’re looking for quality content, you’ve come to the right place. I mean, don’t we all want good content? I like it in hamburger: low fat content and none of that pink slime that was in the news recently. Some people like adult content in their movies. Whipped cream lovers like contents under pressure, otherwise the stuff would just stay in the can. Without a table of contents it’d be difficult to find something in a book, and if you have an alcoholic content higher than .08 you’d better not be behind the wheel. But perhaps you’re looking for a different type of content. It’s hard to tell because content, or awesome content, seems to be all it takes to satisfy even the most discriminating online reader today. This must be true because I’ve read it dozens of times on the Internet. Looking for advice on how to make more “friends” or get retweeted more often? Quality content is the answer from every media guru or how-to website. Do you know what you need to get more readers for your blog or to spiff up your email? You guessed it: quality content. Bloggers get lots of spam in the “comments” sections of their sites. God only knows the purpose of these, except to lure you into clicking on a website—a decision you will regret long after you have your hard drive reformatted. What many of these spammers begin with is praise for the site, using the phrase quality content. No thinking involved here. Blanket quality content could refer to a blog about taxidermy, Cartesian philosophy or football. Inane use of the word, however, is not limited to spammers. Enter two words into a search engine and you’ll be overcome with thousands of websites offering advice on creating awesome content. Often the advice is bland, generic and silly. Case in point: The website sitepoint.com offers an article cleverly entitled “How to Generate Awesome Content.” You need an attention-grabbing headline, accurate information and rich media, we’re told. “Originality is a key ingredient…” the website says, but “…the ideas themselves don’t have to be wholly original.” In addition to this site, and thousands more like it, are web pages that tell where to find awesome content that you can simply appropriate. Other sites offer formatted 140-character content you can easily copy and paste into your tweets. What I’m getting at here is that not only do I object to the term “content,” the necessity of providing stock material and short-cuts is a sad reflection on education or perhaps on our creative powers. Certainly websites that provide summaries and indices of material available elsewhere can be useful—I do it myself. But the notion of just cutting and pasting simply to have something to say is pitiful. So, if you’re looking for awesome content (we’ll leave the task of dealing with those who misuse the word awesome for later), check out my archives, read Dashiell Hammett, Dickens or pick up a copy of the New York Times. Next time we’ll get back to talking about books, mysteries and mystery writers. I read an article once, however, that advised me to keep my blog lively by occasionally posting off topic. It also advised an occasional rant, but I would never do that. Quality content…how often I’ve heard this in my ‘internet marketing’ journey. Everyone wants quality content, Google wants quality content, blogs want quality content, but you’re right…what is what anyway? As, 5 people and they’ll tell you 5 versions of what it means to them. Thanks for passing by my blog, glad to have discovered yours in return. Oh and btw, spammers want not so much a click-through to their site (although that would be nice too, but they know people seldom click through from comments), they want backlinks, which helps (or used to help, lately not so much anymore) with ranking higher in the SERPS. Links and awesome content. Yup, that’s all we want. But quality? Read it, thanks for sharing! Nice off topic post Mr. Bacon! 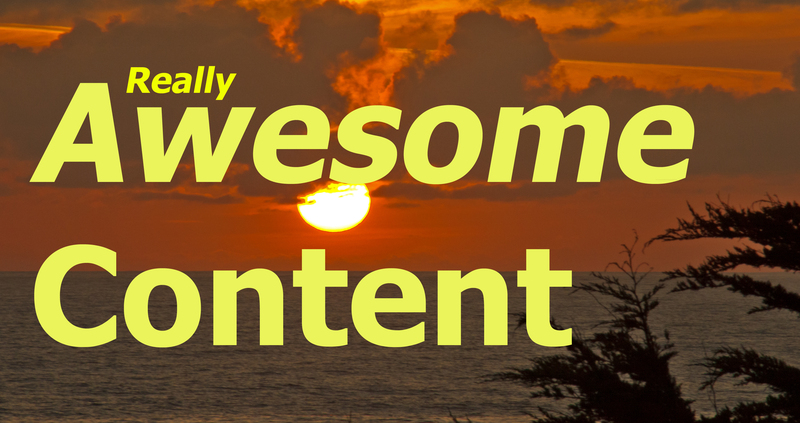 Who doesn’t like awesome content! I think the proper replacement word for awesome should be something like relevant, interesting, or maybe even helpful. I’m not alone. Alison Griswold, writing in Businessinsider.com, lists “content” as the most overused word in business today.